President Donald Trump and Kim Jong Un, the reclusive leader of North Korea, will attempt to iron out the details of a history-making agreement on denuclearisation when the pair meet later this month in Vietnam for their second face-to-face dialogue. The leaders make for strange diplomatic bedfellows: Neither man has a reputation for making friends out of foes, and each has publicly mocked the other. But in the eight months since their first meeting in Singapore there have been notable changes on the Korean Peninsula, including the repatriation of American soldiers’ remains, a cessation in North Korean missile and nuclear tests and a decrease in American-led war games. Trump and Kim agreed at their previous meeting to the “complete denuclearisation” of the peninsula. But since then, the two sides have been unable to agree on what that phrase actually means, leading to a stalemate and a breakdown in talks. Here’s what to expect at the upcoming summit. The North Korean diplomats and officials likely to attend the meeting are some of the country’s most experienced negotiators, who have deftly wrangled with several American administrations. Among those expected are Ri Yong Ho, a seasoned diplomat who represented North Korea for years during the “six-party talks” in the 2000s and is now the country’s foreign minister; and Kim Yong Chol, a former spymaster and one of Kim Jong Un’s closest advisers. In recent months many of the State Department’s most experienced North Korea hands have retired, leaving negotiations to Trump appointees less familiar with the issues and their North Korean counterparts. Those expected to join the president include Mike Pompeo, the secretary of state; John R. Bolton, the national security adviser who has disagreed with Trump on the success of the Singapore talks; and Stephen Biegun, a former Ford Motor executive who was recently appointed to oversee talks with the North Koreans. At the Singapore talks last June, Kim and Trump agreed to a four-point plan. The bullet points — each no more than a sentence — included establishing relations between their countries; building a “lasting and stable peace regime”; working “toward complete denuclearisation of the Korean Peninsula”; and repatriating the remains of Americans killed during the Korean War. 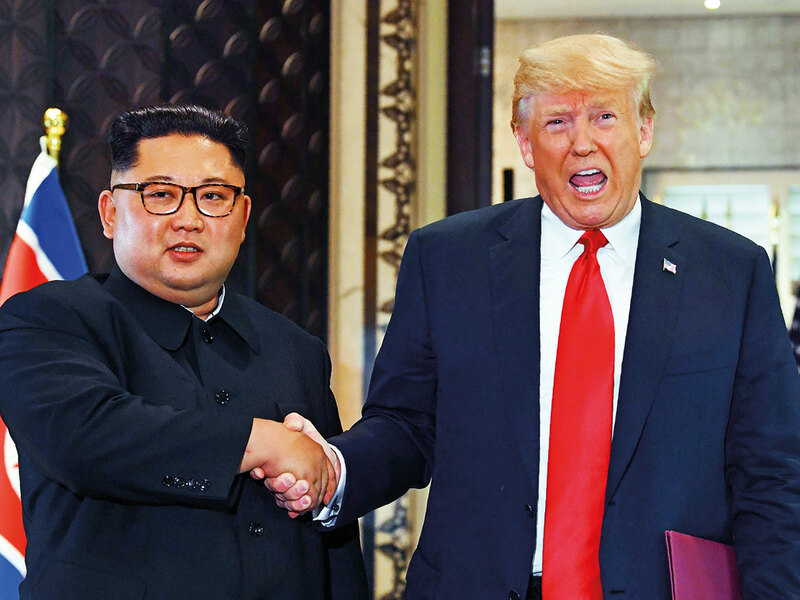 Left undecided were the order in which those points were to be executed and the definitions of terms like “peace regime” and “complete denuclearisation.” After the meeting in Singapore, Trump declared the question of denuclearisation “largely solved,” but the two sides have since been at loggerheads. Effectively, the countries are locked in the same stalemate they have been for years. Washington wants North Korea to end its nuclear weapons programme. But for the North, those weapons are the only leverage it has to get what it really wants — a formal end to the Korean War and diplomatic recognition from the United States. The North said as recently as December that it would not dismantle its weapons program until the United States diminished its military capacity in the vicinity of the Korean Peninsula. Trump announced Friday that the talks would be held in Hanoi, Vietnam’s capital.Vietnam is a powerful symbolic choice. Like North Korea, Vietnam and the United States had fraught relations for decades after a deadly war. More recently, the countries have normalised relations. Vietnam, like North Korea, is a communist country. Through capitalist reforms it has emerged from international isolation to become one of the world’s fastest-growing economies. It is a model Trump hopes will inspire North Korea. Danang, a port city where US soldiers once relaxed on a stretch of sand then known as China Beach, had also been floated as a potential site for the talks. But the North Koreans were reported to prefer Hanoi. Though a second round of talks had been rumored for months, it was not until Trump’s State of the Union address that a date was confirmed. The talks will be held on February 27 and 28, the president said. Trump was last in Vietnam in November 2017 to attend the Asia-Pacific Economic Cooperation summit meeting. The United States and North Korea have previously come to agreements on denuclearisation and the lifting of sanctions, only to see the deals fall apart at the last minute or be chipped away by distrust over time. Previous American presidents have tried a mix of carrots (aid and engagement) and sticks (punishing sanctions) to persuade the North to discontinue its weapons programme. North Korea has traditionally viewed denuclearisation as taking place in sequenced “phases” for which it demands “simultaneous” incentives from Washington for each step. Under the Singapore agreement, North Korea must work “toward” denuclearisation while Washington is obliged to improve ties and remove hostilities on the divided Korean Peninsula.